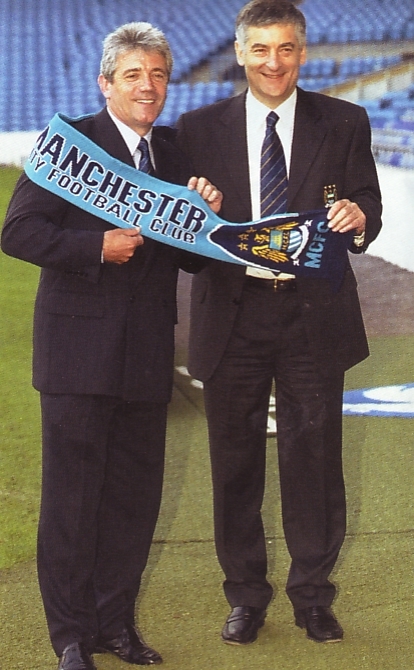 Not for the first time City began a new season with a new Manager, The inspirational Kevin Keegan had taken on the challenge of getting the Blues back into the Premiership and he brought with him Arthur Cox as his assistant and Peter Bonetti as Goalkeeping coach. Added to the playing staff was 39 year old veteran Stuart Pearce together with Eyal Berkovic who came in for £1.5m from Celtic and Simon Colosimo who moved from South Melbourne. Moving in the other direction Mark Kennedy joined Wolves for £1.8m, Spencer Prior moved to Cardiff for £650k and Gareth Taylor agreed a deal at Burnley. Pre-season started with a 2-1 win at Halifax , a 2-2 draw at Scunthorpe ,a 2-1 win at Tranmere and a 2-0 win at Huddersfield in a testimonial game Jon Dyson. ‘Typical City’ started the season with a great 3-0 win at home to Watford but then lost on their travels to Norwich 2-0. City were still attracting crowds of over 30,000 and an appreciative Maine Road crowd were treated to a great 5-2 win against Crewe , and then the Blues made it nine goals in two games as they beat Burnley at Turf Moor 4-2. Due to International duty City had a free weekend and played a friendly at Oldham winning 2-1 in a game that saw the return of Nicky Summerbee who had signed for The Blues on trial for 3 months. Back in the league The fans were then brought down to earth as they were thrashed 4-0 at West Brom and so five games in City stood in a steady 8th position in the Nationwide League Division 1. Away from the League City beat Notts County 4-2 in the Worthington Cup 2nd Round, a match that contraversially went ahead in the shadow of the 9/11 bombings which had occurred just a few hours earlier. City continued their goal spree as they beat Birmingham 3-0 at Maine Road where the virtually unknown but ‘Cult figure to be’ Ali Bernabia made his debut at half-time after being signed on a free the same day and the Kippax watched the mercurial skills of the Algerian virtually win the game on his own. City then lost 4-3 in a classic at Coventry and then made it 16 goals in 4 games as they thrashed Sheffield Wednesday 6-2 at Hillsborough to go fourth in the league six points behind leaders Burnley and Shaun Goater’s two goals took him to ten in the league in just eight games. City cemented their fourth place by beating Walsall at home 3-0, the fifth game on the trot that the Blues had scored 3 goals or more. Amazingly City’s ‘Jekyll and Hyde’ tag returned as they were embarrasingly beaten at home 4-0 by Wimbledon before getting back on the goal trail by knocking Birmingham out of The Worthington Cup 6-0, with Darren Huckerby scoring 4 goals. In the local derby at home to Stockport honours were even in a 2-2 draw. With a quarter of the season gone the free scoring Blues stood in 6th position just 3 points off the promotion places. However promotion talk was put on hold as City failed to win at home again drawing 0-0 with Sheffield United before losing 2-1 at Preston and slipping down to 9th in the league. An ‘about turn’ in form saw the Blues beat Grimsby 4-0 at Maine Road draw 1-1 at Nottingham Forest before winning 3-0 at Barnsley to go 5th in the league. Despite the Blues then beating Gillingham 4-1 at home where a Shaun Goater hat-trick took his goal tally in all competitions to 20, and a new addition was made to the squad as Kevin Keegan brought in Christian Negouai from Charleroi on a four and a half year deal. City slipped to 9th position as they lost 2-1 at Portsmouth. It was tight at the top as only 4 points seperated City from third place. Willie Donachie left the club to become Assistant Manager at Sheffield Wednesday. The Blues got back on track in the League with a 2-1 home win against Rotherham but were knocked out of the Worthington Cup losing 2-0 at Blackburn , back in the league three away games followed a 2-0 win against Grimsby , a 3-2 win at Millwall and a 2-1 defeat at Crystal Palace which saw City move into 3rd place. City then beat promotion rivals Wolves at Maine Road 1-0 and leapfrogged them into second place with exactly half the season gone. A further home win saw Bradford beaten 3-1. But city stuttered to a 0-0 draw against West Brom in their third consecutive home game because their previous game at Crewe had fallen foul of the weather. Danny Granville had played his last game for the Blues as he was transferred to Crystal Palace for an initial fee of £650,000 prior to a fourth home game on the trot which saw The Blues take Burnley apart beating them 5-1 in the last game of 2001. City were now in true promotion form and they beat Sheffield United 2-1 at Bramall Lane on New Years Day to take top spot in the League. The Blues carried their good form into the FA Cup as they beat Swindon 2-0 in the 3rd Round at Maine Road. Then City made it six wins on the trot beating Norwich at home 3-1, Watford away 2-1 and away at Ipswich in the FA Cup 4th Round with an emphatic 4-1 victory in which City’s new signing (a £700,000 signing from FC Copenhagen) Niclas Jensen made his debut. At the same time a contract extension disagreement with Dickson Etuhu saw the promising youngster decide to move to Preston!! It was lucky seven for the Blues with 7 wins on the trot as they beat Millwall 2-0 at Maine Road, however their run came to an end at Wimbledon as they lost 2-1 but still sat top of the table, three points clear of Wolves. A tense game at Maine Road saw City beat Preston 3-2 before The Blues were unlucky to be beaten 1-0 by Newcastle in the FA Cup 5th Round in what was to be an emotional night for Kevin Keegan. City failed to score again as they drew 0-0 at Walsall and the Blues had slipped to second in the league but had two games in hand on leaders Wolves. Further players left the club with Paul Dickov off to Leicester and teenager Leon Mike to Aberdeen. City then signed their first Chinese International player, Jihai Sun from Dallan Shide. Back at Maine Road and the goal machine started again with a 4-0 win against Sheffield Wednesday followed by a 4-2 victory at home to Coventry . The Blues almost sealed promotion with three consecutive away wins, 2-1 at Birmingham, 2-0 at Bradford and 3-1 at Crewe leaving City top of the table and 13. points clear of third placed West Brom. Surprisingly City then spent a club record £4m on Preston’s Jon Macken, Kevin Keegan explained “Maybe we could have got away without buying Jon Macken, in terms of winning promotion, and left the £4m in the bank until the Summer. But. in the circumstances, it may have been excellent timing”. City made it six wins on the trot as they beat Crystal Palace 1-0 at Maine Road, and then slipped up at Stockport losing 2-1 before only managing one point at Rotherham drawing 1-1 and so with five games left City were top of the table eight points clear of third placed West Brom. A 3-0 home win against Notts Forest and a 2-0 away win at promotion rivals Wolves meant City went into their penultimate home game needing just a point to clinch promotion and the Championship, and the players did not disappoint trouncing Barnsley 5-1. City were back in the Premiership and they had done it as Champions. City went to Gillingham and entertained with a 3-1 win. It was a Club record breaking season for the Blues with a record points haul, the most wins in one league campaign, The most away League points and equalling the most goals scored in a season. Richard Edhill left the club as he would not agree to just a one year contract and so Keegan had made him train with the youth team since Christmas.